Hello everyone, It is Chris Sparks! 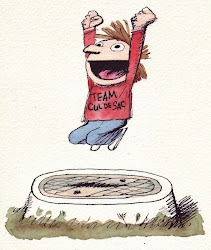 Three years ago Richard Thompson and I started Team Cul de Sac. So far we have raised over 100,000 for the Michael J Fox Foundation. A couple of years ago we even walked in the National Parkinsons Foundation walk. Would you please support my effort this year? My goal is just a hundred bucks but 10 times that would be awesome! Oh I have 10 days to do it! Help please? What is up with Richard Thompson? A book and art show with Bill Watterson? So now that Richard Thompson is talking about it officially. I can chat about some stuff. Yeap, that is correct folks! Not only will there be this cool Complete Cul de Sac for purchase in the spring of 2014(intro by Art Spiegelman)BUT a two man art exhibit at The Ohio State University in the brand spanking new Billy Ireland Cartoon Library & Museum will happen too! That is right folks, Richard Thompson and Bill Watterson is having a little art show for a few months together next year. So if you ever wanted to see some original Calvin and Hobbes strips and see a wonderful wide range of Richard Thompson's mad skills, this will be a once in a life time experience. A big thanks to Jenny Robb and Bill Watterson in making this show happen. We are in for a treat! What is this nonsense about a wide range of art from Richard? Why not just Cul de Sac art? Very good questions! I hope Richard talks about that soon! Drooling yet? You will be, YOU WILL BE!